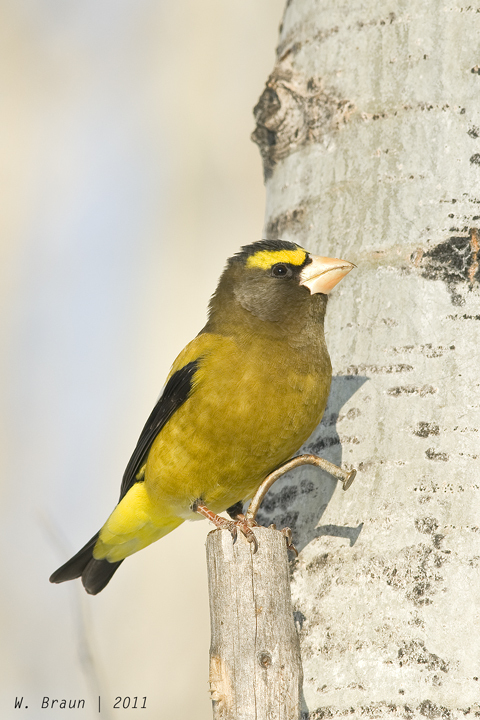 For the birds: Evening or Wandering Grosbeaks? Today I went along with two birding friends, Don Delaney and Ken Hansen, to the Tomahawk area where Don has friends who own a 9-acre plot of woodland and pasture. The objective: to watch and photograph grosbeaks, Evenings and Pines, and whatever else we might encounter. 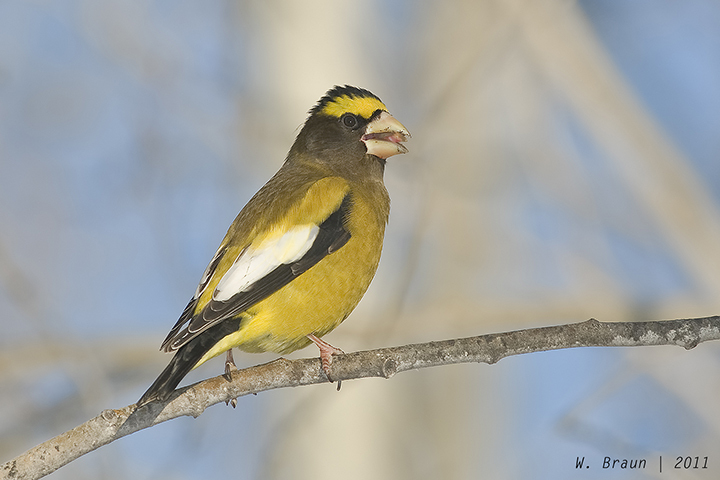 We did not see any Pine Grosbeaks, but were favoured by a rather large flock (30-50) of Evening Grosbeaks. 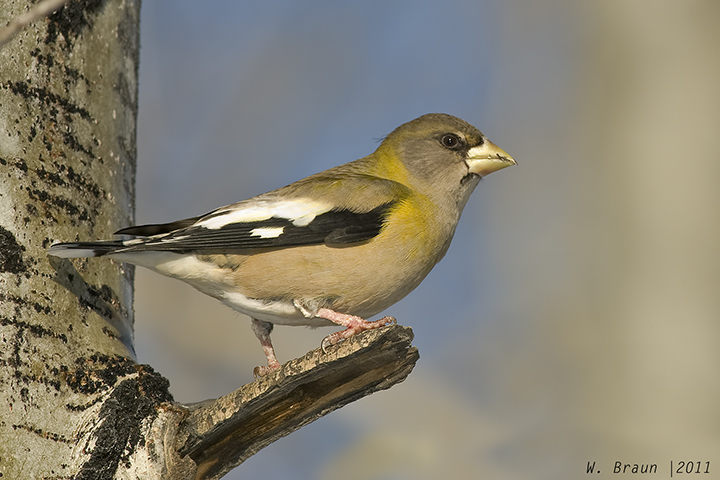 A sunny and warm January day (+2 C), a bonfire, coffee and Grosbeaks. 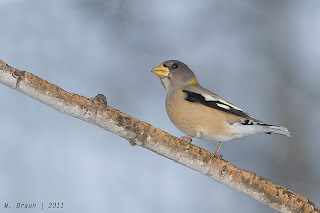 Why is this large, sturdy finch with the large, cone-shaped bill called the Evening Grosbeak or Coccothraustes vespertinus, its official Latin name? 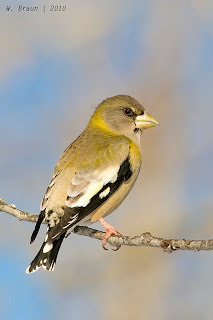 There is not a good reason, in fact, at least if good reason is based on some prominent aspect of the bird's appearance or behaviour. 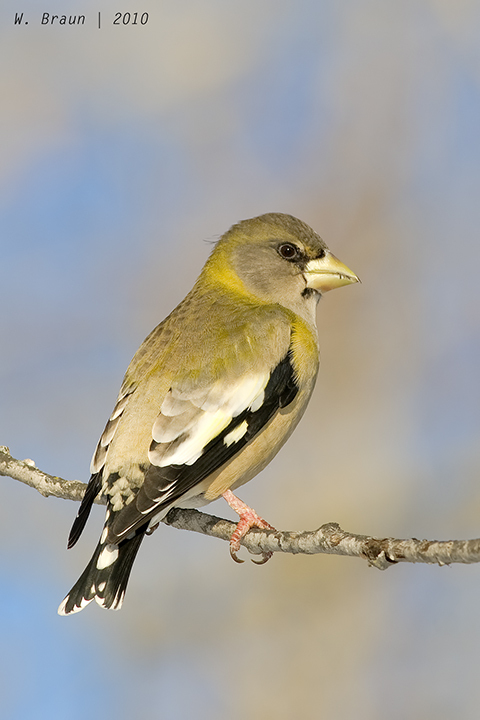 Some people have suggested that "evening" names the time or, perhaps, evensong quality of its warble. 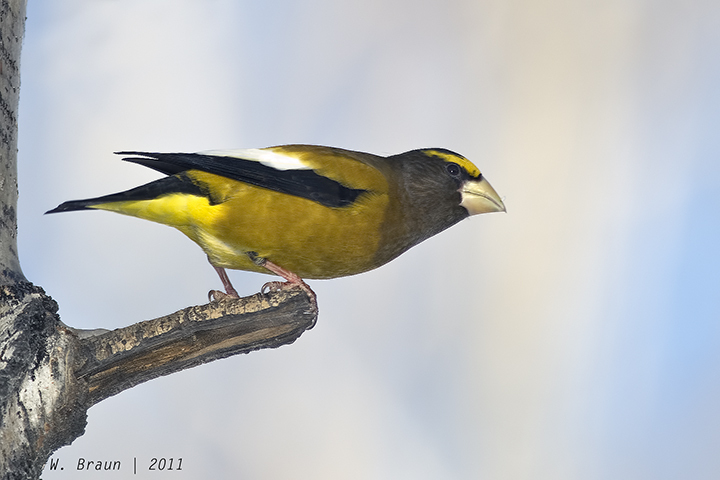 Not so, because the Evening Grosbeak is not a distinguished songbird. It has an extensive repertoire of chirps and calls but not a song, although on rare occasions it does a kind of warble. 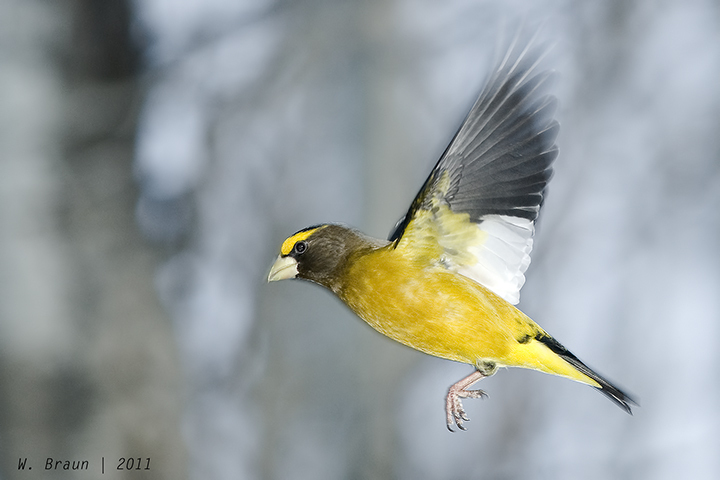 Nor is it particularly active at vesper time over other parts of the day. According to Hinterland Who's Who, "in the early 19th century, English-speaking settlers in the foothills of the Rocky Mountains came across a beautiful big-beaked bird that appeared mysteriously from somewhere in the distant west. 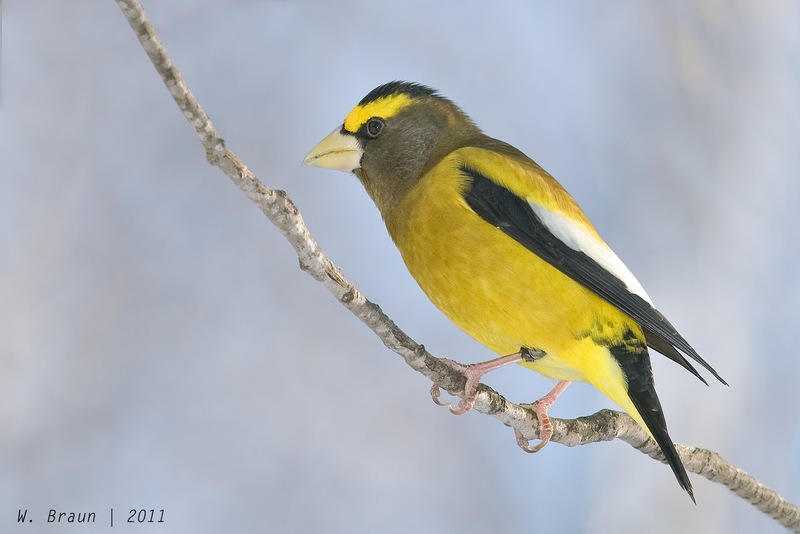 They named it Evening Grosbeak in the mistaken belief that it came out of the woods to sing only after sundown. French-speakers named this bird more appropriately le gros-bec errant, the wandering grosbeak." 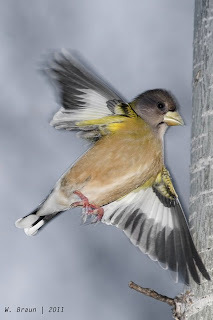 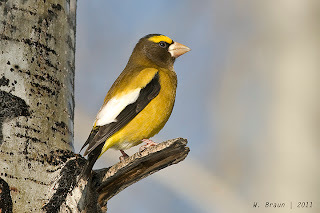 Evening Grosbeaks feed on seeds from the cones of spruce, balsam fir, and pine but they like almost any seed, including sunflower seeds which they can hull with remarkable speed and efficiency. The two pictures below show the difference between the female and the male in colouration. 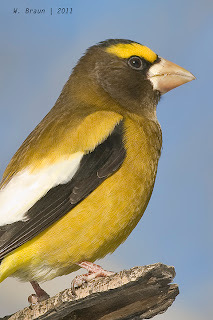 The female is less brilliantly yellow and more silvery than the male.